Variousorbiters, landers and rovers that have explored Mars in the past threedecadeshave revealed tantalizing evidence of the conditions for life, fromfrozenwater at the planet’s North Pole to methane plumes in the atmosphere.Foratmospheric scientist Joel Levine, the evidence has made the case forflying anairplane over Mars stronger than ever. Levinechampions the ARES Marsairplane mission at NASA’s Langley Research Center inHampton, Va. Hebelieves that a robotic, rocket-powered airplane is the perfectplatform forunraveling the Red Planet’s biggest mysteries. "Apowered airplane flying a mile above the surface can obtainmeasurements overinaccessible parts of Mars and collect a whole bunch of data that norover cancollect," Levine said. As opposed to orbiters, meanwhile, the airplanewould be close enough to the ground to get high-resolution images andchemicalsensing data. ARES,which stands for Aerial Regional-Scale Environmental Surveyor, isLevine’sbrainchild. He has now formed a team of 250 people, from airplanedesigners tomission planners to bring his vision of a roboticairplane soaring above Mars to fruition. The team has builtand tested aprototype ARES airplane and they are gearing for the next NASA Marsmissionsolicitation. TheARES airplane prototype is 16.4 feet (5 meters) long, with a wingspanof about21 feet (6.5 meters), and is made of a lightweight polymer-carboncompositematerial. It would be packed with its tail and wings folded into anaeroshellsimilar to the one that brought the rovers to Mars. About12 hours away from the surface, the carrier spacecraft would releasetheaeroshell, which would descend to the surface aided by a parachute.Thirty-twokilometers above the surface, the airplane would be ejected, its wingsand tailwould unfold and the rocket engines would ignite. Levineis most interested in flying ARES over the mountains, craters andvolcanoes inthe southern highlands, where it hasn’t been possible to land safelyuntil now. "Thereare some very interesting things in the southern hemisphere," Levinesaid. "There are regions of very high crustal magnetism, whose origin no oneunderstands. By studying crustal magnetism, we can learn whether itwill shieldthe surfaceof Mars from high-energy solar wind particles. This will helpus learn moreabout radiation that humans on the surface will experience." ARESwould take samples of the Martian atmosphere every three minutes,helping topinpoint the exact source of the methane plumes that have beendiscovered onthe planet — methane on Earth is produced by living systems, but itspoint oforigin on Mars remains a mystery. Equippedwith the right instruments, the airplane also could study subsurfacewater andprobe the ground for telltale signatures of life. Levinefirst got involved with Mars airplanes in 1999. NASA’s administrator atthattime, Dan Goldin, had announced a competition between various NASAcenters toput a lightweight, low-cost airplane on Mars. Theplan was to piggyback the chosen craft aboard an Ariane rocket launchedby theFrench space agency CNES. The airplane flight through the Martianatmospherewas to take place on Dec. 17, 2003 to commemorate the centennial of theWrightbrothers' first powered flight. NASAchose the Langley Research Center team to lead the effort, with Levineas theproject scientist for the mission. The project was cancelled later thatyearfor budgetary reasons, but he has since been convinced that an airplanewas theway to go for Mars exploration. "Anairplane is deployed in the atmosphere," he said, "so you don’t haveto worry about landing on rough terrain or retro-rockets and firing atprecisetimes." 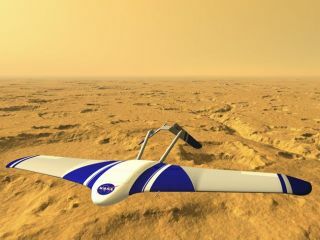 Airplaneswould be ideal for observing large regions at close range, said CharlesWhetsel, manager of the advanced studies and program architectureoffice atNASA’s Mars Exploration Directorate. Todate, however, he says Mars exploration has been conducted withorbiters,landers and rovers, because they typically have long lifetimes ofmonths toyears. Indeed,Levine says ARES’ fuel would only last for a two-hour flight. But inthat timeit could cover close to 932 miles (1,500 km), and after its fuel isdepleted,the airplane should be able to land on the ground and continue makingmeasurements. Besides,he stressed, airplanes would be the most reliable way to observe theplanet’srugged southern region where a rover would find it difficult if notimpossibleto drive. TheLangley team has successfully tested deployment and flight in theEarth’satmosphere at a balloon facility in Tillamook, Oregon, using ahalf-scale ARESmodel. They have folded and packed the airplane into a shell anddeployed froma helium balloon 18.6 miles (30 km) above ground. Theresearchers also have done a series of wind tunnel tests to validatetheirpredictions on how ARES would fly in the Martian atmosphere. TheARES technology is proven on Earth, says Levine, and he is confidentthat aMars mission should happen within the next decade. In fact, ARES wasone offour finalists for the NASA Mars Scout mission in 2002 before thePhoenixmission was chosen. "Ifeel scientifically we have a unique platform and experiment," he said. "ARES is only the first step."